Gateway Energy owns assets in Texas, Arkansas, Missouri, and New York. Hover over a marker below for information about our individual assets. The Seguin system serves a poultry processing and rendering facility owned by Tyson Foods. 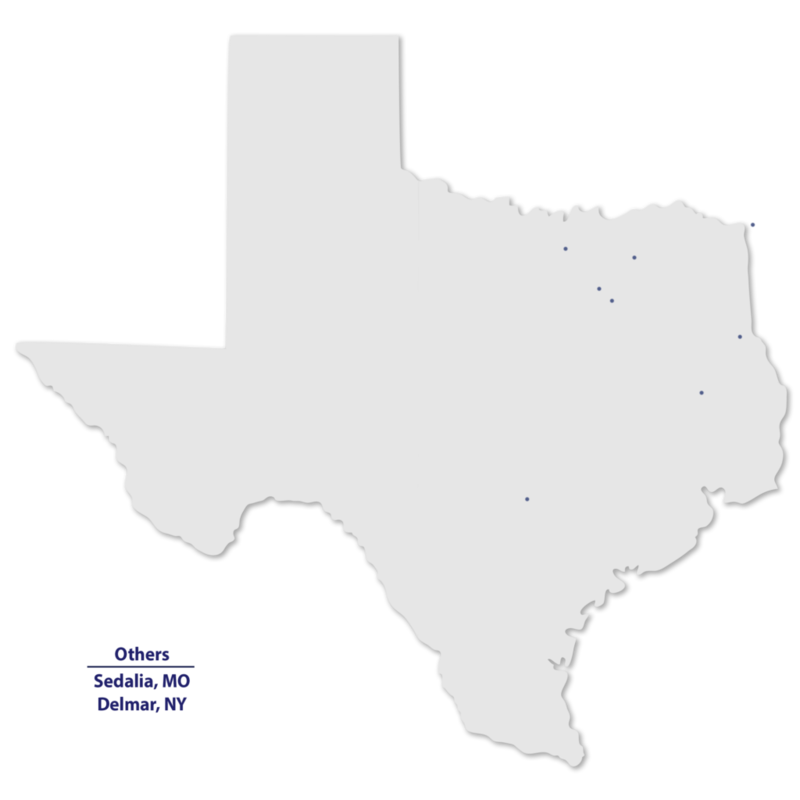 The 1 mile, 2-inch diameter steel pipeline connects with the Enterprise Texas intrastate system through a 3-inch diameter tap. The pipeline is capable of delivering in excess of 4 MMcf/d. The Corrigan system serves an OSB manufacturing plant built in 2018 by RoyOMartin. The 2 mile, 6-inch diameter pipeline connects with the Gulf South Index 59 interstate pipeline and is capable of delivering 6.2 MMCf/d at Gulf South’s prevailing line pressure. The Center system serves a poultry processing facility owned by Tyson Foods. The 2 mile, 3-inch diameter steel pipeline connects with Gulf South Pipeline. The Waxahachie system currently serves seven industrial customers and a natural gas utility. The sales lateral interconnects with three intrastate pipelines at Howard Station and is capable of delivering a maximum of 25 MMCf/d of natural gas to consumers located in the City of Waxahachie via 14 miles of 6-inch diameter pipeline. The Red Oak system currently serves a manufacturing plant built in 2013 by Triumph Aerostructures, LLC and traverses 454 acres of industrial development property within the City of Red Oak. The 3 mile, 6-inch diameter pipeline connects with the Atmos Pipeline-Texas Line (S)(3rd)(20”) pipeline and is capable of delivering a maximum of 25 MMCf/d of natural gas to consumers located in the Lancaster and Red Oak area. The Texarkana, AR system serves a poultry rendering facility owned by Tyson Foods. The 5 mile, 3-inch diameter steel pipeline connects with Natural Gas Pipeline Company of America. The Commerce system serves an aluminum remelting facility built in 2002 by Norsk Hydro ASA. The 3 mile, 4-inch diameter steel pipeline connects with the Atmos Pipeline-Texas system. The Hickory Creek system is located in the Barnett Shale in Denton County, Texas. The gathering system consists of 3 miles of 6-inch and 4-inch diameter pipeline and transports wet gas from wells owned by Eagleridge Energy LLC. The Sedalia, MO pipeline serves a poultry processing and rendering facility owned by Tyson Foods. The 1 mile, 3-inch diameter steel pipeline delivers to the rendering plant. The Delmar, NY system serves an Owens Corning fiberglass plant. The 1 mile, 4-inch diameter steel pipeline connects with Tennessee Gas Pipeline. © 2018 Gateway Energy | Site by Houston Web Design and Hosting, Inc.